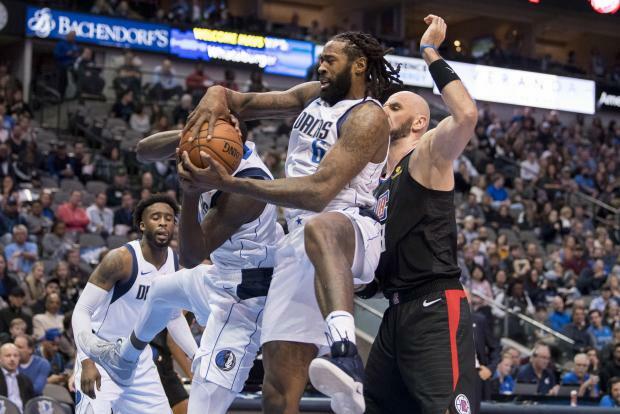 DeAndre Jordan torched his former team for 16 points and a season-high 23 rebounds Sunday, and Dennis Smith Jr., who had a front tooth knocked out in the third quarter, came up with a game-saving block to allow host Dallas Mavericks to earn their seventh consecutive home victory, 114-110 over the Los Angeles Clippers. Jordan was pivotal in the victory, scoring on a late tip-in and then tipping and stealing a Lou Williams pass attempt with 19 seconds to go and Dallas trying to hold onto a 111-110 lead. After the Mavericks went ahead 112-110, the Clippers called timeout and went inside to Tobias Harris. However, Smith blocked the shot and then made two free throws at the other end to seal the victory. Smith amassed nine points, five assists, two steals and two blocks. Dallas got huge contributions from Harrison Barnes, who finished with a game-high 30 points and nine rebounds, and reserve J.J. Barea finished with a season-high 24 points, four assists and five rebounds. Montrezl Harrell led Los Angeles with 23 points while Williams and Danilo Gallinari had 21 apiece. Kyle Kuzma had 23 points and eight rebounds to lead Los Angeles past the visiting Suns. The Lakers ran their winning streak to three and climbed a season-high five games above .500. LeBron James had 22 points, six rebounds and eight assists and Brandon Ingram had 15 points for the Lakers. Richaun Holmes scored a season-high 15 points off the bench, and Deandre Ayton finished with 10 points and 10 rebounds for the Suns, who have lost five in a row. Jimmy Butler hit two free throws with 1:31 remaining and a jumper 41 seconds later to stave off a Memphis rally, helping host Philadelphia hang on for a win. Ben Simmons and Joel Embiid recorded double-doubles for the 76ers, who completed a 3-0 homestand with their fourth straight win. Butler finished with 21 points and JJ Redick a team-high 24 for the 76ers. Mike Conley had a team-high 21 points and five assists for the Grizzlies, who have lost four of their last five games. Anthony Davis had 36 points, 19 rebounds and eight assists, and visiting New Orleans handled Charlotte. Jrue Holiday added 19 points, and Nikola Mirotic scored 16 for the Pelicans. New Orleans won for just the second time in seven games while the Hornets lost for the fourth time in six games. Frank Kaminsky had 19 points to lead a strong effort from the Hornets' bench, which had a combined 67 points. DeMar DeRozan scored a season-high 36 points -- including 15 straight in the third quarter -- and LaMarcus Aldridge added 29 points on 11-of-15 shooting from the floor as host San Antonio Spurs defeated Portland. The Spurs snapped a two-game losing streak while the Blazers lost for the fifth time in six games. Rudy Gay added 18 points for San Antonio, with Patty Mills scoring 15. Damian Lillard led all scorers with 37 points and added 10 assists for Portland, while CJ McCollum added 24 points. Dwyane Wade made two free throws with 3.2 seconds left, and Miami defeated visiting Utah when Jazz star Donovan Mitchell saw his 3-point attempt from the left elbow bounce in and out. On the winning play, Wade drove to his right in a tie game and drew a foul on Jazz 7-foot-1 center Rudy Gobert, who went for the block. Mitchell scored 18 points, but he finished the game shooting just 8 of 24 from the floor. He also missed six of his seven 3-point tries. Miami's Hassan Whiteside had a monster game: 23 points, 20 rebounds and three blocks. It was his 11th career 20-20 game and his third this season.